March 12, 2018 by Margaret King . Posted in " News Releases " . Tags " GirlsInSTEM, STEAM, STEM " . Parents looking for ways to help their daughters prepare for college or careers got some timely assistance during a workshop surveying a wealth of local programs, including classes from Sally Ride Science, aimed at inspiring students in science and technology fields. The workshop was part of an annual conference held by the nonprofit group Expanding Your Horizons of San Diego. The event March 10 on the University of San Diego campus featured a variety of STEM (science, technology, engineering and math) workshops for girls in grades 6 through 10 and their parents. 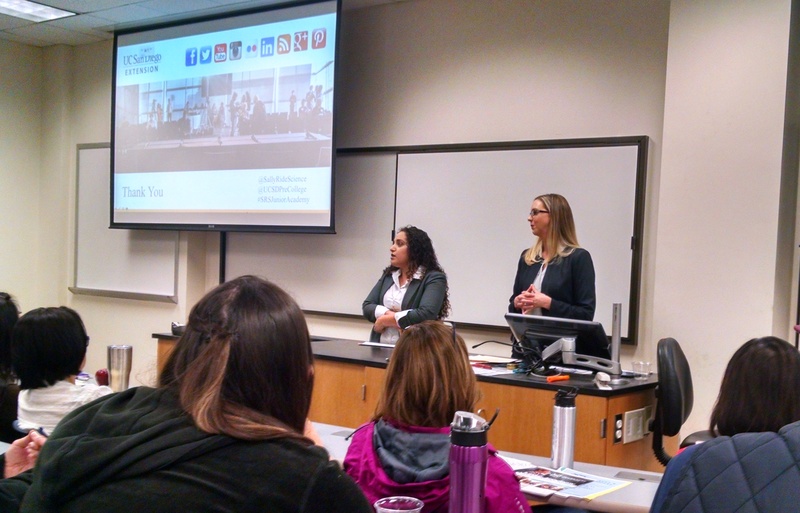 An overflow audience of parents attended the workshop that included an overview of pre-college programs offered by UC San Diego Extension, where Sally Ride Science is based. Maysoon Dong and Megan Lancaster, program managers for Extension’s Pre-College and Career Preparation Programs, explained the offerings and answered parents’ questions. Extension’s pre-college programs include Academic Connections, GELS (Global Environmental Leadership and Sustainability), and Test Preparation. Lancaster highlighted Sally Ride Science programs, including Library NExT, a partnership between the San Diego Public Library and UC San Diego. Library NExT offers free Sally Ride Science STEAM (STEM plus arts) workshops at library branches around San Diego. Topics range from Messy Science and Tiny-House Architecture to Video Game Design and Physics of Fidget Spinners. Lancaster also talked about the Sally Ride Science Junior Academy, a summer program of hands-on workshops for middle school and high school students. This summer’s academy, to be held at Mission Bay High School from June 25 to July 20, features a greatly expanded lineup of fun STEAM courses. Junior Academy students don’t just learn about subjects like robotics, programming or oceanography, Lancaster noted. They also benefit from the examples of their instructors, who include UC San Diego undergraduates and Scripps Institution of Oceanography graduate students. “Their job is not just to be a teacher but to be a role model,” she said. Sally Ride Science was founded in 2001 by Sally Ride, America’s first woman in space, along with her partner, Tam O’Shaughnessy, and three other friends. Their goal was to inspire girls and boys of all backgrounds to study science and to imagine themselves in science and technology careers. Ride served as chief executive officer until her death in 2012. In 2015, Sally Ride Science joined UC San Diego and began launching innovative new programs. Expanding Your Horizons of San Diego is part of a national program of conferences designed to inspire girls to pursue opportunities in STEM fields. The San Diego group has held a STEM conference for girls every year since 2001. New Video from UCTV’s STEAM Channel: What Is Sally Ride Science at UC San Diego?